The Toronto Raptors took a trip to the Windy City to face the lowly Chicago Bulls on Saturday night. The Raptors have been sharpening their claws against weaker teams recently as they prepare for the battles to come in the post season. The addition of Marc Gasol may not have translated on the stat sheets but since his arrival, Toronto has been one of the best passing teams in the league and have been shooting the three-pointer at a Golden State-like clip. This is a version of the Raptors that has not been seen before. A team that can hurt you in any way without any discernable weaknesses. The Chicago Bulls are barely better than a G-league team, so the outcome of the game was never in doubt. However, as if they were snake bitten, Toronto picked up yet another injury as they learned that Patrick McCaw will be out of action for at least 3 weeks with a thumb sprain. Toronto was not going to take any chances and opted to rest OG, Siakam and Kawhi. With playoff seating looking more and more settled, Coach Nurse may want to consider covering his players with bubble wrap lest he tempts the fate of their health. This game was over before it began. In a complete team effort, Toronto took care of business and came away with the dominant victory. Marc Gasol had a big night in one of his best games as a Raptor. Flanked by his old Spanish running mate, Gasol looked comfortable, poised and in control. He was a maestro from the high post, conducting cuts and creating opportunities. Most importantly, it looks like his shot is finally starting to come around. He scored 17 points on 6/11 from the floor (including 3 triples), while also pulling down 8 rebounds and handing out 6 assists. Gasol played like a man amongst boys in an impressive display of talent. Timothe Luwawu-Cabarrot, a player who averages 3.5 points on the season, was thrown in the fire to play 32 minutes. In that time, he was able to grab a team high 10 rebounds to go with 18 points, 2 blocks and an assist. He also stretched the floor by hitting 4 of his 9 shots from deep. Some may say that these are empty points (after all, someone had to score) but for Timothe, these were big minutes and big shots as he tries to carve a place for himself in the league. Fred VanVleet has quietly become one of the most accurate shooters on Toronto’s roster. Along with Lowry and Leonard, VanVleet can hit the jumper from anywhere on the floor. Tonight, he only needed a little bit of space to create chances and get his shot off. VanVleet scored 23 points on 9/15 from the field to go with 4 rebounds, 6 assists and a steal. His IQ and craftiness more than make up for his physical limitations. The Wichita State product played with a chip on his shoulder and took full advantage of anyone who underestimated him. Jeremy Lin has been putting in extra work to get back his offensive touch. Lin has been pressing since he arrived to Toronto, he has been unable to find his place in the offence and has only contributed in spurts. But considering the talent on this roster, it was only a matter of time until he found his comfort zone again. The Bulls were the perfect opponent to get shots up against in game time situations. Lin ended the night with 12 points, 2 rebounds, 3 assists and 2 steals. This was a confidence building game for Lin and an early sign that he may be finally starting to turn the corner. The Raptors experimented with former Spanish national teammates, Serge Ibaka and Marc Gasol, as starters in a big Toronto frontcourt. With so many key figures sitting, Serge knew there would be more playing time and he was ready to step up. Ma Fuzzy Chef was in fine form tonight as he had one of his most athletic performances of the season. 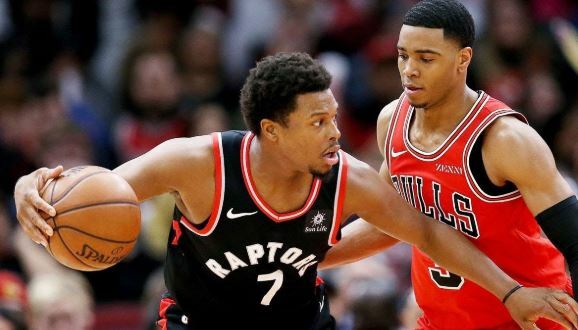 Not only was he effective on the pick and roll with Lowry, he also knocked down a couple of threes and was able to keep up with the young Bulls when they tried to turn the game into a track meet. Ibaka had 23 points, a game high 12 rebounds, 2 assists and a block. Serge is starting to play at a high level again. His conditioning, defence, and consistent shooting will make it hard for Nurse to take him off the floor. Since Gasol was traded to Toronto, the Raptors have been shooting better than 40% from 3. Live by the 3 – Toronto doubled up on the Bulls from 3-point range. The Raptors nailed 18 shots from deep while Chicago only converted 9. Sharing the Wealth – The Raptors handed out 34 assists as a team. They also had 7 players in double figures showing how well the offence was distributed. Next up is the Orlando Magic on Monday night at the Scotiabank Arena. Toronto will be looking to extend their winning streak while the Magic will be fighting for their playoff lives as their hopes to stave off elimination are being held by an ever-thinning thread.